Contains a sample of 'Apache' performed by The Incredible Bongo Band. A side is massive festival tent party bomb. words. Track 3 is lossy/mp3 sourced. The indians are coming! After being a prey for it's classic rhythm loop, the famous "Apache" from Michael Viner's Incredible Bongo Band get his groove back. 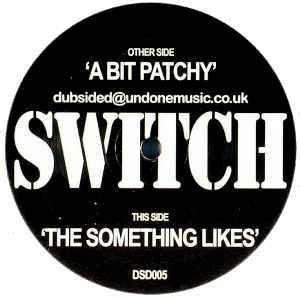 The pun regarding the title "A-BIT-PATCHY" is funny and intended as a tribute. This promo CD contains the Riff & Rays and Groovecutters versions of the title, unavailable on the commercial single. "Da-da-day!". The original version mix up Electro and Breakbeat, bringing back the unforgettable old school rhythm loop. There is also a sound which I suspect to be taken from Stanley Kubrick's "2001" movie (opening of the pods doors). Then, the Indian/western thematic hit you: a fragmented sampling of the "Apache" theme is replayed, with a lot of echo. Amazing. Probably the best version of all. The effect is stunning. Eric Prydz remove all the samples from his version, but is still keeping the flavour of the original. A female voice, singing what seems to be an Indian lullaby, is heard throughout the track, very electro oriented. Riff & Rays and the Groovecutters delivers 2 different filtered House versions. Riff & Rays uses another sample of "Apache", played numerous times in the popular French TV show "Tout Le Monde En Parle". The Groovecutters also use other samples for their remix. Both tracks are constructed upon commercial standards and tested formulas, although they work very well. All the mixes includes the "Da-da-day!" line. Is this some kind of dialect? Or just a reminder that the "day" has come?